Enterprises today are under pressure to do more with less IT resources. While storage capacity requirements may double every 18 months on average, storage budgets remain relatively flat. At the same time, the rise of virtualization and private cloud deployments in data center infrastructure has created a need for greater agility and higher performance. Software Defined Storage (SDS) provides a solution to many of the current challenges posed by the changing IT landscape. In contrast to traditional storage infrastructure, Software Defined Storage migrates features and services from the physical hardware to a software layer above storage. In addition to eliminating vendor lock-in, this enables cost reductions through the use of commodity servers and storage. It also allows for system capacity and performance to be easily scaled in response to changing business needs. 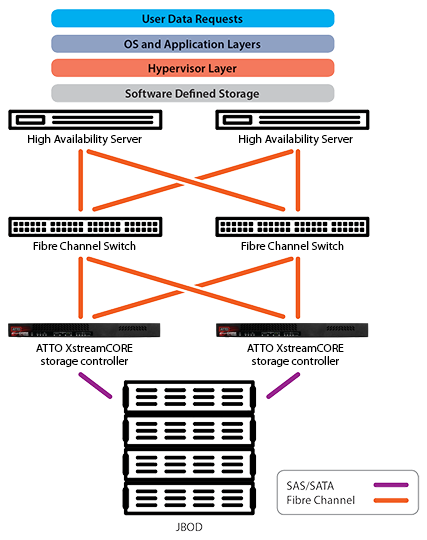 ATTO offers high performance, reliable storage controller and fibre channel products and solutions for the implementation of software defined storage.